Historians rarely compare the mostly working-class and poor Korean population in Japan and African Americans seeking economic justice in the United States. 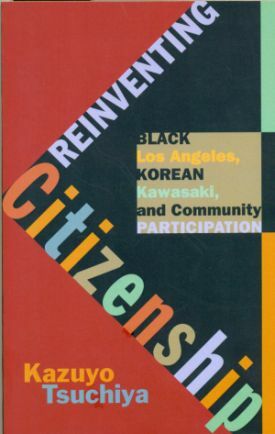 Japanese scholar Kazuyo Tsuchiya of Kanagawa University takes on that task in her new book, Reinventing Citizenship: Black Los Angeles, Korean Kawasaki, and Community Participation. Here she explores the efforts of Koreans in Kawasaki City, Japan and their African American counterparts in South Central Los Angeles in refashioning the boundaries of citizenship in their respective nations. Her description of that book and its objectives appears below. In 1975, African American theologian and political activist James H. Cone accepted an invitation to deliver a lecture on the U.S. civil rights movement and black theology at the Kawasaki Korean Christian Church. The Kawasaki church had long been the hub of zainichi activism in Japan. The zainichi are ethnic Koreans who came to Japan before or during World War II and have lived there ever since. The term also refers to their offspring who regard Japan as their permanent place of residence. They had long suffered ethnic discrimination from their Japanese neighbors and not surprisingly they turned to the U.S. civil rights struggles in the 1960s for inspiration. Some zainichi leaders had become familiar with Cone’s book, A Black Theology of Liberation (1970), where he argued that blackness in the United States had come to symbolize both oppression and the struggle for liberty. He also maintained that blackness stood for all victims of oppression. For zainichi Koreans struggling in Kawasaki City, Japan, a major industrial hub 11 miles south of Tokyo, Cone’s work offered both inspiration and a framework through which they could contest discriminatory practices. Long before Cone arrived to lecture, local activists at the Kawasaki Korean Christian Church not only read Cone’s books on black theology, they also immersed themselves in the works of other influential African American church leaders such as Dr. Martin Luther King Jr. who were committed to black liberation struggles. Many young zainichi activists of the Kawasaki Church understood that their struggle for full rights and citizenship in Japan had numerous parallels to the struggles facing African Americans. They connected their own cause to the causes of black American Christian leaders. Reinventing Citizenship: Black Los Angeles, Korean Kawasaki, and Community Participation explores one of those parallel struggles, comparing African American welfare activism in Los Angeles, California during the 1960s with Korean battles for welfare rights in Kawasaki City during the 1960s and 1970s. It also delineates the interactions, exchanges, and translations that emerged between black liberation struggles and the zainichi Korean pursuit of citizenship rights. As I conducted my research, the question often arose: why even compare? What is the point of melding together two “distinct” histories situated in vastly differing local and national settings? After all, African Americans are citizens of the United States by virtue of the 14th Amendment to the U.S. Constitution adopted in 1868, while Koreans are non-citizens in Japan. How can a comparison be possible? I explained that even after the 14th Amendment and the Civil Rights Act, which passed in 1964, some 96 years later, the question of African American citizenship remained unsettled. Black Angelenos were well aware of that fact and moved into the vanguard of the efforts to recast citizenship. Likewise, the zainichi deeply understood their political marginalization in Japan. Koreans in Japan, who had been considered “Japanese imperial subjects” during the colonial period (1910 to 1945), became classified as non-nationals and were ironically stripped of their previous legal rights when Japan concluded the San Francisco Peace Treaty with the Allied Powers in 1952. By the early 1970s, however, more than three-fourths of the Koreans in Japan were Japanese-born, and this new generation initiated a series of political struggles against the Japanese government and major Japanese corporations, demanding their rights as citizens. This story starts, however, in Los Angeles. In the late 1960s, Los Angeles was at the forefront of that decade’s national anti-poverty struggles. Anti-poverty programs in the United States quickly evolved after American President Lyndon B. Johnson initiated his now famous War on Poverty in 1964. That war, while national in scope, would be fought on local ground under a variety of conditions. In New York City the poor exercised a substantial influence over the local anti-poverty programs. The Chicago, Illinois model involved city officials appointing representatives of the poor to the local Community Action Agency. Thus the Chicago political machine retained controlling power over the Community Action Program and the city’s War on Poverty. Los Angeles black leaders created a third model by fashioning opposition movements against local poverty organizations which were led by Mayor Sam Yorty, and in doing so began to craft alternative visions of citizenship. For example, in 1963, Johnnie Tillmon, a mother from the Watts section of Los Angeles, founded ANC [Aid to Needy Children] Mothers Anonymous, one of the first organizations in the nation created by and for welfare recipients. Tillmon then joined the Neighborhood Adult Participation Project (NAPP), a Los Angeles War on Poverty program which stood at the heart of a great debate over political participation of the poor, and over time became a unique social space for nurturing local leadership. Through NAPP, Tillmon eventually expanded her activism from the local level to the national level, from ANC Mothers Anonymous in Watts to the National Welfare Rights Organization (NWRO) in Washington, D.C., which was established in June 1966 by welfare activists across the nation. In ANC Mothers Anonymous and later as a national leader of the NWRO, Tillmon called for the establishment of a system that guaranteed women’s autonomy in controlling their own lives whether they preferred working outside the house, remaining at home to devote themselves to child-rearing and housework, or doing both. She contended that welfare recipients should get either “decent jobs with adequate pay” or adequate income to live decent lives. She sought to construct a system in which women on welfare could make a choice, and by so doing, contest the narrow definitions of “work” and “welfare,” the very premises on which the American welfare state had been built in the 1930s. Activists like Tillmon insisted on their economic, educational, and welfare rights (not only de jure but also de facto rights) and argued that they as full citizens of the nation had the right to participate fully in and enjoy the benefits of the expanding American welfare state. I also explore how Kawasaki Koreans challenged the city and nation’s exclusionary welfare policies, asserted their welfare rights, and in the process voiced alternative visions of citizenship. Under leaders like Reverend Lee In Ha, they transformed Kawasaki City into a bastion of equal rights. First, they took aim at specific city welfare and education programs that had historically excluded Koreans, such as an allowance for dependent children, the right to public housing, access to the bulletin listing elementary schools for preschoolers, and the right to apply for scholarships. They then established the Kawasaki Association for Promoting Zainichi Koreans’ Education, and worked to transform the city’s education policies. The Association of Mothers Watching Out for Children, led by Song Puja, a second-generation Korean, rose to the forefront in challenging the city’s board of education. They eventually succeeded in persuading the city to enact a policy towards resident non-nationals in March 1986, a landmark for the educational rights of zainichi Koreans and other non-nationals. Additionally, in June 1988 they successfully pressured the city into creating the Fureaikan, a youth community center. Although they were denied the right to vote both at the local and national levels, Kawasaki Koreans helped devise the “Kawasaki system” of welfare, and turned the city into a model for eliminating the nationality requirement in child welfare, public housing, and compulsory education. In fact, the struggles of the local Korean population, along with Japan’s ratification in 1979 of the International Covenant on Civil and Political Rights, and the International Convention on the Status of Refugees in 1981, resulted in the abolition of the nationality clause in major social welfare programs at the national level. Research for this book began in 1998. I was lucky enough to be given the opportunity to study at two graduate schools, the American Studies Program at the University of Tokyo, and the Department of History at the University of California, San Diego, where I majored in American history and minored in Japanese history. As I moved back and forth between Tokyo and San Diego, and explored archives in South Central Los Angeles and Kawasaki City, I met people who introduced me to what I later discovered were the parallel histories of African Americans and zainichi Koreans. As I teach African American history to my students at Kanagawa University, I continue to see connecting elements between these histories that took place in distinct local and national settings. Black Angelenos and Kawasaki Koreans developed different strategies in dealing with their respective cities and federal/national governments. But Reinventing Citizenship shows that they had much in common. Both communities stood at the center of national debates about citizenship and welfare during an era of massive welfare expansion. Both communities asserted visions of welfare and citizenship that challenged the then conventional ideas about each concept. Black Angelenos and Kawasaki Koreans succeeded in exploiting contradictions among policymakers, creating limited coalitions, securing concessions, and transforming the welfare programs into struggles for racial/ethnic, class, and gender equality. They forced policymakers to rethink previously-accepted distinctions between “us” and “them,” the “deserving” and the “un-deserving,” “producer” and “parasite,” wages and reproductive labor, and the notions of citizenship itself. Furthermore, as the visit of James Cone symbolized, black liberation struggles and the zainichi pursuit of citizenship were not only parallel movements, they were linked to each other. Zainichi activists in Kawasaki connected their own cause to the causes of African American reform advocates in the U.S. Reinventing Citizenship tells that story. James H. Cone, A Black Theology of Liberation, Twentieth Anniversary Ed. (Maryknoll, N.Y.: Orbis Books, 1990); Kazuyo Tsuchiya, Reinventing Citizenship: Black Los Angeles, Korean Kawasaki, and Community Participation (Minneapolis: University of Minnesota Press, 2014). James H. Cone, A Black Theology of Liberation, Twentieth Anniversary Ed. Participation (Minneapolis: University of Minnesota Press, 2014).